Bring on the Music: 2018 Levitt Season Dates and more! The countdown to the 2018 Levitt concert season is on! Across the country, free outdoor concerts at Levitt venues and Levitt AMP sites begin kicking off this month, ready to bring people of all ages and backgrounds together through the power of free, live music. Levitteers throughout the nation will be enthralled by this year’s wide range of rising stars and award-winning talent taking to Levitt stages. Scroll down to check out when free Levitt concerts will be taking place in your community! Each permanent outdoor Levitt music venue presents 50 free concerts every year and is managed, programmed and supported by a Friends of Levitt nonprofit partner, with Levitt Los Angeles run by the Foundation. This year we welcome Levitt Pavilion Dayton as it launches its inaugural free summer concert series! Every year the Levitt AMP Music Series takes place in 15 small to mid-sized towns and cities at pop-up sites in public spaces, each presenting at least 10 free concerts throughout the summer or fall. 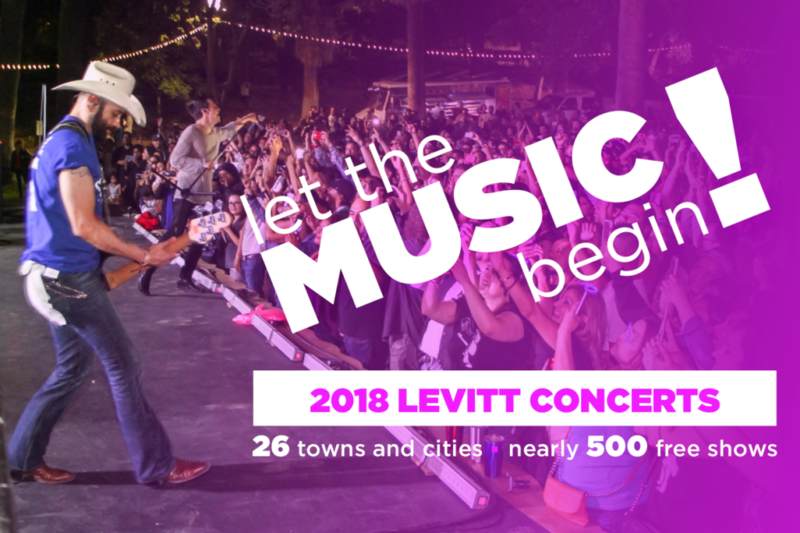 This year, the Levitt Foundation is also supporting free Levitt concerts in four additional communities, including a Levitt National Tour stop at the future home of Levitt Shell Sioux Falls (opening in 2019) and special outreach concerts in the former Levitt AMP locations of Greensboro, N.C., Hattiesburg, Miss. and Jacksonville, Ill.
Mark your calendars and get ready to enjoy a season of free, live music with friends, family and neighbors. We look forward to seeing you on the Levitt lawn! This entry was posted in Concerts, Levitt in America on May 16, 2018 by Louisa Johnston. We enjoyed the concerts in Hattiesburg at Chain Park so much in 2017! Thank you! Regarding the St. Johnsbury rain location: The Fenton Chester Arena is located at 145 College Rd. Lyndon, VT 05850, not St. J. Thanks for your comment, Susan. We’ve just confirmed and edited the revised rain location address. Enjoy the Levitt AMP St. Johnsbury Music Series! Where is the jazz? There is nothing here! Levitt concerts feature a wide range of artists playing world music, country, jazz, Latin, blues and more. Hope to see you on the Levitt lawn! Sorry to see there are no concerts in atlantic city. I have enjoyed them in the previous years. Middlesboro is PUMPED up for another great year of Levitt Concerts. A huge thank you to the Levitt Foundation for giving our small community something to look forward to for 10 summer nights of wonderful music.